Even though there’s still one week left in January, you might be thinking about the first time you’ll turn on the ceiling fans this spring. You may even have the fans running counterclockwise right now to help circulate the warm air from your furnace. Whatever the case may be, it’s important to make sure your fans are working properly and that they’re the right size for the room they’re in. At Hortons in La Grange, Chicago, and Orland Park, we can help you find the perfect fan options! If you have a large living room, but the previous owner put up a small ceiling fan, you might be thinking about updating the fixture. Before you visit one of our showrooms, take a few minutes to measure the length and width of the room. Once you have those dimensions, you can multiply them together to determine the room’s square footage. This number will help you choose the right blade span for your new ceiling fan. For example, a room that’s 150 to 225 square feet should have a fan with a blade span of 44 to 54 inches. Obviously, the smaller or larger the room is, the smaller or larger the blade span will need to be. When it comes to the number of blades, you can have an odd or even number. If you go with an odd number such as three or five, you’ll measure from the center of the fan to the blade tip, and then multiply that number by two to get your blade span (since there isn’t a blade directly across from the one you’re measuring). For even-numbered blades, you can measure the distance between opposing blades. How High Should You Hang Your New Fan? Once you know which fan you want, you’ll need to determine at which height it should be hung. The height of your ceiling will be the determining factor here, and you’ll want to be sure the fixture hangs low enough to circulate air adequately. 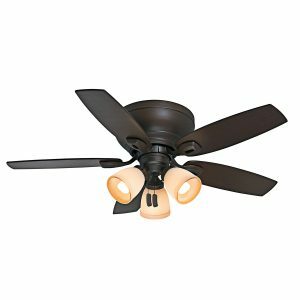 For short ceilings (approximately eight feet), you’ll want a hugger fan, but as you get to nine feet and above, you’ll want to hang the fan with the appropriate downrod. For each foot of ceiling height you add, you can add three inches to the downrod length. For example, if you have a 10-foot ceiling, you’ll need a 12-inch downrod. If you’re mounting the fan on a sloped ceiling, our staff can help you find the right accessories. When you’re shopping for new ceiling fans in Chicagoland, there’s no better choice than Hortons. Visit one of our locations today to find your fixture!